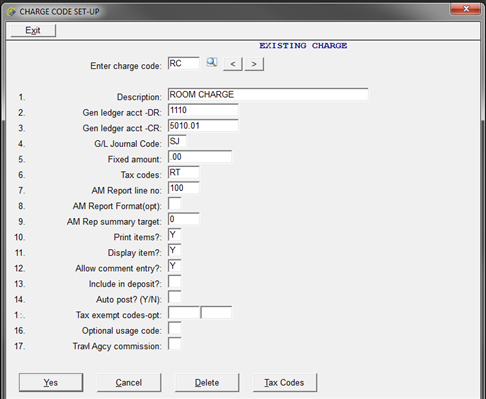 Hotel Charge codes are required for all charges posted to folios including POS charges. To set them up go to Manager/Setup > Hotel Control Files Setup > Charge Codes. Before getting started, read the list of codes that are required or restricted. The information changes as you move from field to field. Several topics will be covered in this section. As you enter a new charge code you must start with the code. Press Enter to move to the next field and continue. To look up an existing code, type the code in the "Enter charge code" field, type ?+Enter or click the magnifying glass. "Enter charge code" is where you enter the code for this item whether it is a new item or an existing item. If the code already exists the screen will display "EXISTING CHARGE". Each code may be up to four alphanumeric characters. CASE MATTERS. "B" is not the same as "b". This allows you an additional 26 characters. See the list of codes to find out which codes are required or restricted. No charge code may be the same as a payment code. "1. Description" may be up to 30 characters. The description prints on reports and on folios. "2. Gen Ledger acct -DR" is the General Ledger DEBIT account to which transactions using this code should post. If you are not sure what to put in this field, consult your accountant. Execu/Tech does not provide Accounting services of any kind. If you are using Execu/Tech's Back Office® Accounting or one of our interfaces to a third-party General Ledger system, this is a required field. If you are not, then you may leave this blank. "3. Gen Ledger acct -CR" is the General Ledger CREDIT account to which transactions using this code should post. If you are not sure what to put in this field, consult your accountant. Execu/Tech does not provide Accounting services of any kind. If you are using Execu/Tech's Back Office® Accounting or one of our interfaces to a third-party General Ledger system, this is a required field. If you are not, then you may leave this blank. "4. G/L Journal Code" is the 2-character General Ledger journal code when transactions using this code should post. If you are not sure what to put in this field, consult your accountant. Execu/Tech does not provide Accounting services of any kind. If you are using Execu/Tech's Back Office® Accounting or one of our interfaces to a third-party General Ledger system, this is a required field. If you are not, then you may leave this blank. "5. Fixed amount" is the optional fixed dollar amount for this charge. A fixed amount is required for all Auto-Post charges. A fixed amount is required for flat room taxes or fees (rather than percentage taxes) such as resort service fees. A fixed amount may be applied to any charge code. NOTE: The user will not be able to override the fixed amount. If you require that option, then create a charge code for the fixed amount and a charge code for the variable amount. Example: Charge code PK for Parking where the user would insert the amount when posting, and charge code PK25 for Parking at $25 which will post $25. "6. Tax codes" must be RT* (a code beginning with RT) or ST* (a code beginning with ST). The code that goes into this field is the tax that will apply to this charge. ST* taxes will apply to all charges EXCEPT room charges and POS charges. RT* taxes will apply ONLY to room charges. POS taxes are defined separately and are discussed under POS Revenue Codes. For non-taxable items, leave this field blank. Note: For RT* taxes, you must also fill in the tax information in the "tax codes" button at the bottom of the screen. See Room Taxes applied to Room Charge. "7. AM Report line no" determines where on the AM Report and Daily Report this line item prints. AM Report Line numbers are relative and sequential. For example, 550 follows 540. If no charge codes are assigned line numbers 541 through 549, then the code assigned 550 will print immediately after 540. Remember to save numbers to assign to heading and total lines. It's also a good idea to save numbers for future use. For example, if you use 345 and 348, you will have lines 346 and 347 to assign later to new codes you might set up. NOTE: If this field is blank, then the item will not print on the AM Report. "8. AM Report Format (opt)" is used only for comment (heading) or total lines. A charge code designated C is used as a heading or comment on the AM Report. Total lines should be designated Z (zero total); 1 (sub total); or 2, 3, or 4 (intermed total); S (summary - see below). This field should be left blank for all other codes, including codes for all true charges. "9. AM Rep Summary target" is optional and is the summary total line number that this item is targeted to. This is how it works: Your AM Report might have a heading Restaurant with charge codes for Restaurant Food, Restaurant Wine, and Restaurant Liquor followed by a total line for Total Restaurant. Then Your AM Report might have a heading Lounge with charge codes for Lounge Food, Lounge Wine, and Lounge Liquor followed by a total line for Total Lounge. You might want a summary target for Total Food, Total Wine and Total Liquor. Each of these (Total Food, etc.) will need a charge code with an AM Report line number in Field 7. Then insert that line number into Field 9 (AM Rep Summary target) for the charge codes which should be included in that summary total. "10. Print items?" determines how these charges print on the AM Report. This does NOT determine whether they print or not; any charge code with an AM Report line number can print on the AM Report; any charge code with a blank AM Report line number will not print on the AM Report. In the "Print items?" field, enter Y to print the number of items and average. Enter N to print neither the number of items nor the average. Enter I to print items only without average. If left blank this field will default to print number of items and average. "11. Display item?" if set to Y or if left blank will allow this item to display on the Post Charges/Payments (Post Folio) screen. If set to N this charge code will not display on the Post Charges/Payments (Post Folio) screen. This commonly is done with manager-level codes. All POS charges (if using Execu/Touch POS) should be N as these charge codes should not be used at Front Desk. "12. Allow comment entry?" when set to Y allows the user to add a comment when posting this charge code. N disallows a comment to be entered and populates the field with the charge code description. Default is Y. "13. Include in deposit?" typically is set to N for all charge codes except REF (see List of Codes). Y will include this charge code in the "Bank Deposit" section on the Cashier Report. "14. Auto post? 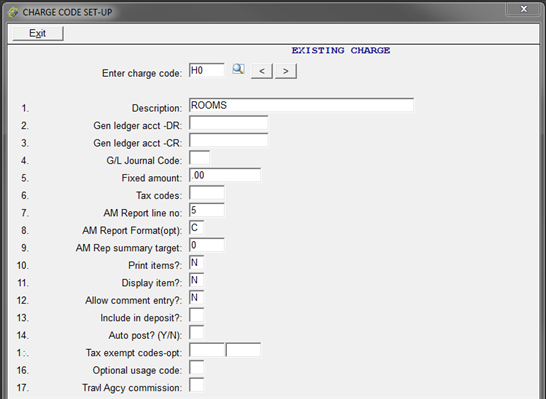 (Y/N)" is set to Y is this charge should post automatically when "Post Room and Tax" is run from the Night Audit menu. Example: Parking Fees. See Auto-Post Charges for instructions. Use your down-arrow key rather than pressing Enter to leave this field; otherwise a new window will open. "15. Tax exempt codes-opt" are optional RC* charge codes that may be used instead of RCTE for "Room Charge Tax Exempt". When "Post Room and Tax" is run at night audit, Room Charge (RC*) for tax exempt guests will post with this code instead of RC*. You may designated one code such as RCFX for full exemption such as and another code such as RCPX for partial exemption. The entire amount of RC will post under either RCFX or RCPX instead of RC*. These codes must be set up in Charge Code Set-up. "16. Optional usage code" allows one of three settings. W sets this code as an amenity for WebRes®. N will exclude this charge from "Total Revenue" on the Report Generator. Q will prompt for quantity when this charge code is selected at Post Charges and Payments (Post Folio). "17. Travl Agcy commission" allows this charge subject to travel agency commission if set to Y. N will exclude this charge from travel agency commission. P will make this charge subject to travel agency commission only for packages. - These are lines that print on your AM Report as section headings such as "Rooms" and "Restaurant". A section should have a heading followed by charges (income or liabilities) followed by a total or subtotal. 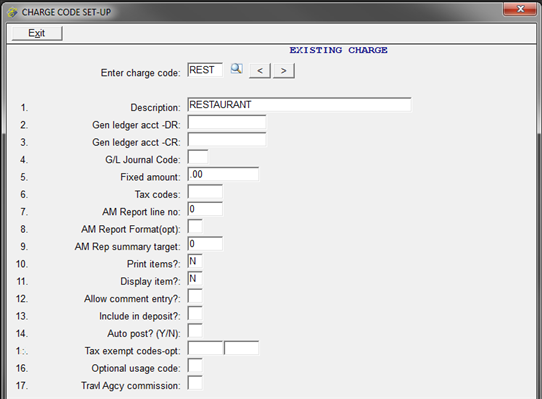 This will allow you to view Room Charges and their total, then Restaurant Charges and their total, and so on. "Enter charge code" is where you enter the code for this item whether it is a new item or an existing item. If the code already exists the screen will display "EXISTING CHARGE". Each code may be up to four alphanumeric characters. CASE MATTERS. "B" is not the same as "b". This allows you an additional 26 characters. See the list of codes to find out which codes are required or restricted. Typically hotels use H (for heading) followed by a "section" number such as 0 or 01. For example, H01 for Rooms, H02 for Restaurant, H03 for Spa and so on. "1. Description" may be up to 30 characters. The description prints on the AM Report and Daily Report. "2. Gen Ledger acct -DR" can be left blank since this charge code will be heading and not an actual charge. "3. Gen Ledger acct -CR" can be left blank since this charge code will be heading and not an actual charge. "4. G/L Journal Code" can be left blank since this charge code will be heading and not an actual charge. "5. Fixed amount" can be left blank since this charge code will be heading and not an actual charge. "6. Tax codes" can be left blank since this charge code will be heading and not an actual charge. "7. AM Report line no" determines where on the AM Report this heading prints. AM Report Line numbers are relative and sequential. For example, 550 follows 540. If no charge codes are assigned line numbers 541 through 549, then the code assigned 550 will print immediately after 540. The heading should be assigned a line before the charges that follow it. It's also a good idea to save numbers for future use. For example, if you use 345 and 348, you will have lines 346 and 347 to assign later to new codes you might set up. NOTE: If this field is blank, then the item will not print on the AM Report. "8. AM Report Format (opt)" should be C for heading or comment on the AM Report. "9. AM Rep Summary target" can be left blank since this charge code will be heading and not an actual charge. "10. Print items?" can be left blank since this charge code will be heading and not an actual charge. "11. Display item?" should be set to N so that this charge code will not display on the Post Charges/Payments (Post Folio) screen. "12. Allow comment entry?" can be left blank since this charge code will be heading and not an actual charge. "13. Include in deposit?" can be left blank since this charge code will be heading and not an actual charge. "14. Auto post? (Y/N)" can be left blank since this charge code will be heading and not an actual charge. Use your down-arrow key rather than Enter to leave this field; otherwise a new window will open. "15. Tax exempt codes-opt" can be left blank since this charge code will be heading and not an actual charge. "16. Optional usage code" can be left blank since this charge code will be heading and not an actual charge. "17. Travl Agcy commission" can be left blank since this charge code will be heading and not an actual charge. - These are lines that print on your AM Report as section totals such as Total Rooms and Total Restaurant. A section might have a heading followed by charges (income or liabilities) followed by a total or subtotal. This will allow you to view, for example, Room Charges and their total, then Restaurant Charges and their total, and so on. "Enter charge code" is where you enter the code for this item whether it is a new item or an existing item. If the code already exists the screen will display "EXISTING CHARGE". Each code may be up to four alphanumeric characters. CASE MATTERS. "B" is not the same as "b". This allows you an additional 26 characters. See the list of codes to find out which codes are required or restricted. Typically hotels use T (for Total) followed by a "section" number such as 0 or 01. For example, T01 for Total Rooms, T02 for Total Restaurant, T03 for Total Spa and so on. "7. AM Report line no" determines where on the AM Report this line item prints. AM Report Line numbers are relative and sequential. For example, 550 follows 540. If no charge codes are assigned line numbers 541 through 549, then the code assigned 550 will print immediately after 540. The line number assigned to a total should be after the actual charge codes that are totaled. It's also a good idea to save numbers for future use. For example, if you use 345 and 348, you will have lines 346 and 347 to assign later to new codes you might set up. NOTE: If this field is blank, then the item will not print on the AM Report. "8. AM Report Format (opt)" should be Z (zero total); 1 (sub total); or 2, 3, or 4 (intermed total). "9. AM Rep Summary target" can be left blank since this charge code will be a section total and not an actual charge. "11. Display item?" should be N.
"12. Allow comment entry?" can be left blank since this charge code will be a section total and not an actual charge. "Enter charge code" is where you enter the code for this item whether it is a new item or an existing item. If the code already exists the screen will display "EXISTING CHARGE". Each code may be up to four alphanumeric characters. CASE MATTERS. "B" is not the same as "b". This allows you an additional 26 characters. You may have more than one code for guest room charges but they all MUST begin with RC. See the list of codes for more information. "5. Fixed amount" should be left blank since room rates are set up in the Rooms or Room Types record. "6. Tax codes" must be RT* (a code beginning with RT) if applied to RC*. RT* taxes will apply ONLY to room charges. You may have up to four taxes per RC*. If all RT* taxes should apply to the RC* code, then enter the first one in this Tax Codes field. For example if you have RT1, RT2, and RT3, then RT1 would go in this field. If only RT1 and RT3 should apply, then leave this field blank and click the "Tax Codes" button or press Alt+T to enter the taxes in a new window. See also Room Taxes applied to Room Charge. "7. AM Report line no" determines where on the AM Report this line item prints. AM Report Line numbers are relative and sequential. For example, 550 follows 540. If no charge codes are assigned line numbers 541 through 549, then the code assigned 550 will print immediately after 540. Remember to save numbers to assign to heading and total lines. It's also a good idea to save numbers for future use. For example, if you use 345 and 348, you will have lines 346 and 347 to assign later to new codes you might set up. NOTE: If this field is blank, then the item will not print on the AM Report. "8. AM Report Format (opt)" should be left blank. "12. Allow comment entry?" when set to Y allows the user to add a comment when posting this charge code manually rather than through "Post Room and Tax" at night audit. N disallows a comment to be entered and populates the field with the charge code description. Default is Y. "13. Include in deposit?" typically is set to N for all charge codes (see List of Codes). Y will include this charge code in the "Bank Deposit" section on the Cashier Report. "14. Auto post? (Y/N)" should be set to N since room charges post at "Post Room and Tax" from the night audit menu. Use your down-arrow key rather than Enter to leave this field; otherwise a new window will open. "16. Optional usage code" should be blank or set to N for this charge code. - When a check/ticket in Execu/Touch point of sale is closed to "ROOM CHARGE" or "ACCOUNT CHARGE" rather than to a payment such as cash or credit card, a charge such as Restaurant (REST) will post to the guest folio or an account master folio. Funds have not been collected yet. At the same time, this same code will post as a credit into the POS Master folio just as a payment code such as CA would post. Therefore, the POS check is closed. There will be a DEBIT (charge) in the guest folio or account master folio and a CREDIT in the POS master folio, giving you a net sum of ZERO. The charge journal should always show a zero total for this charge. NOTE: This clearing charge code is not the same as a charge code used for posting POS revenue such as Restaurant Food. Clearing codes should NOT be used for manual postings unless advised by Execu/Tech. "Enter charge code" is where you enter the code for this item whether it is a new item or an existing item. If the code already exists the screen will display "EXISTING CHARGE". Each code may be up to four alphanumeric characters. CASE MATTERS. "B" is not the same as "b". This allows you an additional 26 characters. See the list of codes to find out which codes are required or restricted. This charge code should be referenced in the Execu/Touch POS Store Record under the Hotel settings. "2. Gen Ledger acct -DR" may be blank since this is a clearing charge code and nothing should post to GL. "3. Gen Ledger acct -CR" may be blank since this is a clearing charge code and nothing should post to GL. "4. G/L Journal Code" may be blank since this is a clearing charge code and nothing should post to GL. "5. Fixed amount" should be blank. "6. Tax codes" should be blank. "7. AM Report line no" may be blank since this is a clearing code which should always total zero. "8. AM Report Format (opt)" should be blank. "9. AM Rep Summary target" should be blank. "10. Print items?" should be blank. "12. Allow comment entry?" may be blank. "14. Auto post? (Y/N)" should be N or blank. Use your down-arrow key rather than Enter to leave this field; otherwise a new window will open. "15. Tax exempt codes-opt" should be blank in both fields. "16. Optional usage code" should be blank. "17. Travl Agcy commission" should be blank. - Execu/Touch Point if Sale automatically will post charges (revenue and liabilities) and payments into a POS Master Folio so that all POS transactions are included in the hotel's statistics and reports including the Charge and Payment Journals, Final Recap, AM Report, and Daily Report. Each POS item must have a valid POS Revenue Department (such as F for Food or SP for Spa Product) and each POS Revenue Department must point to a valid Hotel charge code such as FOOD or SPAP. POS charges should post only from point of sale and you should not post them manually unless advised by Execu/Tech. "Enter charge code" is where you enter the code for this item whether it is a new item or an existing item. If the code already exists the screen will display "EXISTING CHARGE". Each code may be up to four alphanumeric characters. CASE MATTERS. "B" is not the same as "b". This allows you an additional 26 characters. See the list of codes to find out which codes are required or restricted. 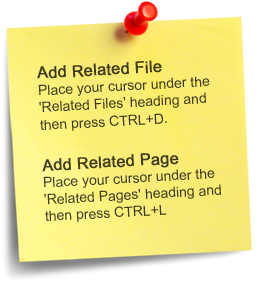 This is the code that goes into Execu/Touch when setting up the POS Store Record or Revenue Departments. "1. Description" may be up to 30 characters. The description prints on reports and on POS master folios. "5. Fixed amount" should be left blank. "6. Tax codes" should be left blank. This field designated a tax that should post automatically to this charge. POS taxes are charged within POS and do not need to be charged again. Taxes posted from POS should have a separate charge code such as FTAX. POS Tax codes do not go into field 6. "11. Display item?" should be blank for POS items. All POS charges should come from POS and never be posted manually. "14. Auto post? (Y/N)" should be blank. Use your down-arrow key rather than Enter to leave this field; otherwise a new window will open. "15. Tax exempt codes-opt" should be blank. - Up to four taxes (RT*) may be applied to each room charge (RC*). 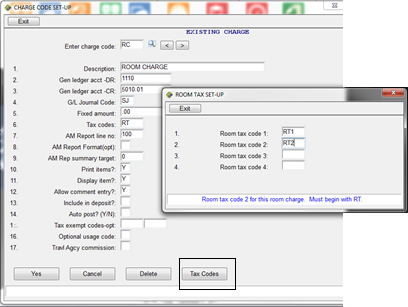 Display or create the RC* room charge and then click the "Tax Codes" button at the bottom of the screen or press Alt+A. When the ROOM TAX SET-UP window opens, enter up to four taxes (RT*) that should apply to this Room Charge (RC*) as shown below. Click "Exit" or press Esc when finished. Click "Yes" or press Alt+Y to save the charge code. 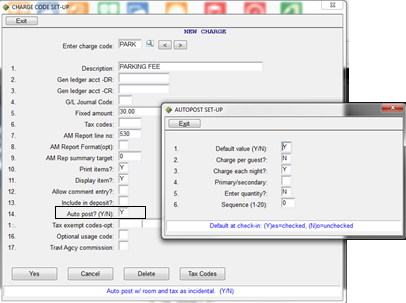 - Auto-Post charges are used to post specific charges when "Post Room and Tax" is run from the Night Audit menu. These are separate from room and tax charges and package inclusions. Auto-post charges may post nightly or first night only. Examples are parking fees and key deposits. Note that although you can create up to 20 Autopost codes, you may only select ten per guest. 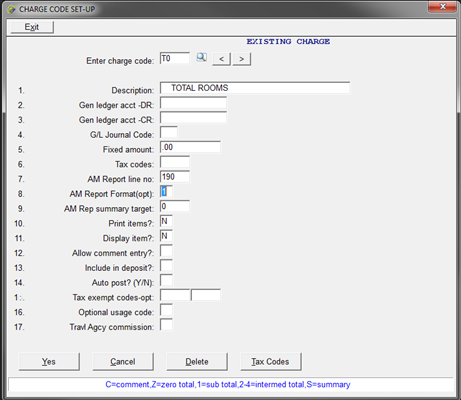 In the charge code setup screen for this charge, you must enter an amount in Field 5, "Fixed amount". The charge will not auto-post if there is no fixed amount. Enter Y in field 14, "Auto post? Y/N". The AUTOPOST SET-UP window will open. "1. Default value (Y/N)" sets the default at check-in. Y sets the default as checked to charge this guest. N sets the default as not checked. Charges that apply to most or all guests can be set to Y and charges applied less often can be set to N. This saves time at check-in since the user simply can press Enter to select the item as checked (apply to guest) or unchecked (do not apply to guest). "2. Charge per guest?" will charge each person if Y and will charge per room if N.
"3. Charge each night?" will charge each night if Y and will charge first night only if N.
"4. Primary/secondary" designates posting to the primary folio or secondary folio for guests with split folios. "5. Enter quantity" can be set to Y to select a quantity from a drop-down at check-in. N does not allow quantity. "6. Sequence (1-20)" determines the order in which each item displays at check-in. Each auto-post code should have a unique sequence number between 1 and 20. You can skip numbers, allowing codes to be inserted at a later time. Once you designate a sequence number do NOT change it. Note that although you can create up to 20 Autopost codes, you may only select ten per guest. RC* You must have at least one RC* charge code. Any code beginning with RC must be used for Room Charge only. Any charge that is not a Room Charge must NOT begin with RC. You may have more than one RC* but each must begin with RC. Examples: RCC for Room Charge Cabins; RCH for Room Charge Hotel. RCTE / RCTM RCTE must be used for Room Charge Tax Exempt. RCTM may be used for Room Charge Military Tax Exempt if you want it tracked separately. RCNI If you have non-inventoried rooms you should set up charge code RCNI. RCNI is used internally by Execu/Suite when room charge posts to a non-inventoried room at Night Audit. RT* RT* must be used for room/lodging taxes and fees that apply to RC* charges. Any tax that should apply to RC* must begin with RT. You may have more than one RT* such as RT1 and RT2. Any tax not applied to RC* must NOT begin with RT. No charge code may begin with RT unless it is a room tax or fee that applies to RC*. RT* taxes must also be set up in Tax Codes . ST* Any tax OTHER than room tax must begin with ST. You may have more than one ST*. Taxes posted within Execu/Touch® point of sale do not need to begin with ST and are explained below. MOV If you have a movie posting interface you must set up a MOV charge code. LC and LD If you have a call accounting interface you must set up LC for locals and LD for long distance and international calls. GC** Used with Execu/Gift. If you are using Execu/Gift please read the Gift Card Setup Guide before assigning codes. REF REF is a charge code applied to a Guest Refund that is to be handled outside Front Desk such as through A/P. This code is NOT for normal refunds such as crediting guest payments. The refund should use the actual payment code such as VS.
Events, Spa, Activities, F&B Income from outlets should also have charge codes. Beginning each set of codes with the same letter is convenient but not required. Example: ERM, EFD, EWN, ESC for Events charges of Room, Food, Wine, and Service Charge. H* and T* Charge Codes should be set up for formatting the AM Report heading comments and total lines. Typically H* is used for headings such as H01 and H02, for "Rooms" and "Restaurant", etc. Typically T* is used for totals such as T01 and T02 for "Total Rooms" and "Total Restaurant". $TRA The required charge code for payments to travel agencies is $TRA. This code must not be used for anything else. Typically the G/L debit will be the travel agency commission expense account but you should consult your accountant. Typically the G/L credit account will be the bank account from which checks are paid but you should consult your accountant. "Display" should be set to N. This code should never used when posting manually to a folio. It is internal use only. CITY CITY is hard-coded for special circumstances and should be not used. Payment Codes No code set up as a Payment Code should be used for a Charge Code. No code set up as a Charge Code should be used for a Payment Code. Make sure to look up required or restricted payment codes before creating new charge codes.